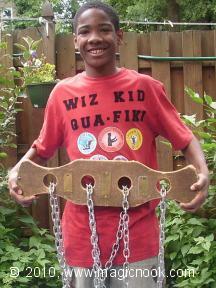 Born Al-Quadir Marsh in Newark, NJ, Qua-Fiki joined the Wiz Kids in January of 2008 and started on his career as a magician. He is the grandson of Phineas Spellbinder, nephew to Wiz Kid Director Frederick Goode, and cousin to Wiz Kids Eleazar Goodenough and Wilhelmina Goodenough. His step father is Wiz Kid Lee, so magic is definitely in his environment, if not his blood. He is currently working on escapes as his Wiz Kid specialty. He is also working on three more magic books; "Super Hero Magic", "Storybook Magic,"and "Escapes For Teens" (for 2011 publication). In 2013 at age 18, he became a trustee of The Wiz Kids, Inc. In 2014 he started his own troupe of Wiz Kids in Newark, NJ. Wrote: Blendo Ropes (with help from Phineas Spellbinder in The Wizards' Journal #16). Co-authored Go Fish Card Tricks (2010) with Phineas Spellbinder. Books in progress - Super Hero Magic (2010-2014), Escapes For Teens (2010-2014), and Storybook Magic (2010-2014). 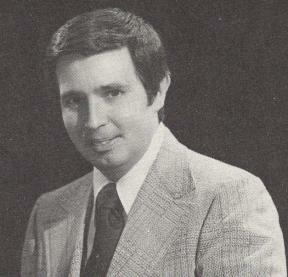 His early years were spent in Elmhurst, Illinois (Harlan Tarbell's hometown), a western suburb of Chicago. 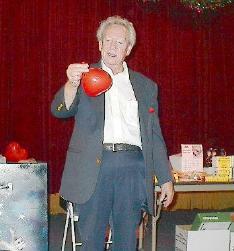 His interest in magic was began in 1950, from seeing Dr. Tarbell perform. Then he received his first magic book, Tarbell Course in Magic - Volume 1, on his eleventh birthday. After discovering that Dr. Tarbell had donated his entire course to the local library, Jon spent many hours studying each volume, along with many other magic books in the library. He joined the IBM and the SAM in 1966, is a member of the Order of Merlin, and a Lifetime Member of the Magic Castle. He is currently the Associate Editor of Richard Kaufman's Genii magazine. Prior to accepting this post, he contributed to numerous other magazines. Wrote: Arcade Dreams, Marlo Without Cards (1997), The Artful Dodges of Eddie Fields (1976), In a Class by Himself, The Legacy of Don Alan (1996), The Wild Card Kit (1992), At The Table, Card Finesse 1 and 2, Card Fixes, Legendary Kabbalah, Sankey Unleashed, Counthesaurus, Hierophant, The Ascanio Spread, Sticks and Stones. 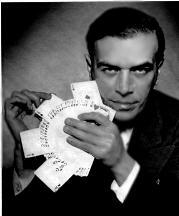 An English magician from Reading, Berkshire, he performed magic for the British troops in 1919. 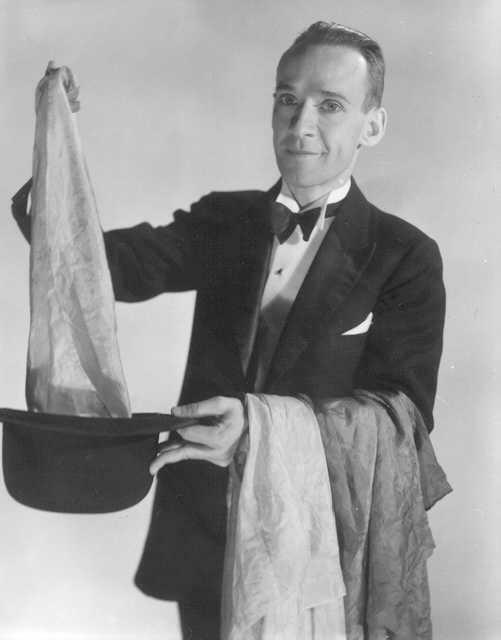 In 1923, he became a vaudeville magician, performing The Holdup Trick, the Silk to Match Box, the Pip Card, Inkbottle and Turnip, and many others. Born James W. Raeke, Wayne Raeke was a member of the Baltimore, Maryland Yogi Magic club and part of the Baltimore magic scene through the 60's & 70's. He was a barber by trade, and did magic as a hobby, with the occasional show here and there. He was always working on new effects and routines. In 1970 he was the manager of The Jokers Wild Magic Shop on Kenwood Ave. in the White Marsh area. The shop moved to Belair Road in 1972 and lasted until 1976. When the shop closed, Wayne moved to Houston, Texas and started a youth magic group, The Jokers Wild Junior Club. About that time his health started to fail and he ended up with diabetes and in a wheel chair. While he worked on and routined quite a number of magical effects for his students, the only thing that he really is known for was his Anytime, Anywhere, Linking Ropes, originally dated 1965, and then reprinted and republished in 1981 in its current form with Bill Palmer's editor's notes and illustrations. His contribution to magic is based on an obscure knot, known as the "Running Knot" and found in the 1919 Boy Scout Manual. It is of little use to anyone, but Wayne recognized its importance to the Linking Rope Routine that he was working on. Anyone who has tried it is amazed that he even discovered this use for such an obscure knot. Some inventors, like U.F. Grant, churn out a new trick practically every day. Others, like Wayne Raeke, produce one effect per lifetime. 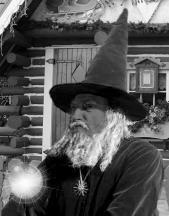 All enrich the art of magic and are worthy of recognition for their efforts. Thanks to Marty Grams for providing the basic information, and to Bill Palmer for providing additional information used in the above biography. C. James Rainho was born in Portugual, but immigrated to the United States as a child. He began his interest in magic at the age of 10, and his interest in playing country western music on the guitar at about the same time. Both music and magic have been a part of his life ever since. Invented: Electronic Production Candles, Flame of Kan-Del (1955), Fountain of Silks with Candle Production, Fountain of Silks with Dove Production, Color Changing Records, Tied at the Stake Illusion rope tie, and many more. 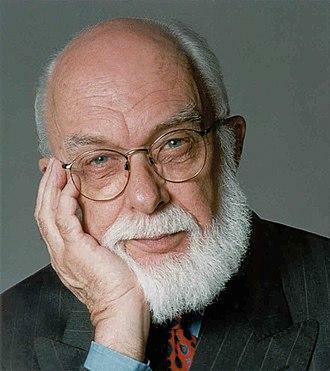 Born Randall James Hamilton Zwinge in Toronto, Ontario (stage name - The Amazing Randi) is a stage magician, escape artist, and scientific skeptic best known today as a challenger of paranormal claims and pseudoscience. He became a naturalized American citizen in 1987. He is best known today as a debunker of the paranormal. He has written about the paranormal, skepticism, the history of magic and is founder of the James Randi Educational Foundation (JREF). 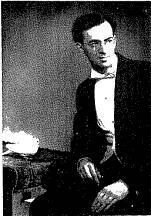 Born Harold Randolph Rice in Salineville, Ohio, his interest in magic came from seeing performances of S. S. Henry, who was playing one of the vaudeville circuits. Young Harold saw shows free in return for feeding Henry's pet goat, which vanished from a box twice each day. Rice attended the University of Cincinnati as an art major and soon was designing and creating his own silks for a magical silk act. Silk King Studios was created in 1929 when local magicians persuaded Rice to make silk squares for them. Rice made monthly contributions to the Linking Ring from 1932 to 1940, and then began publishing his collections of silk magic effects in small books. The first volume of Rice's Encyclopedia of Silk Magic was published in 1948 and contains many of his own silk magic inventions. 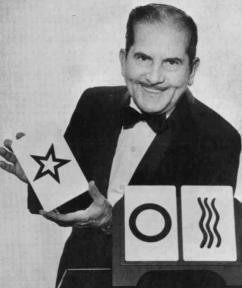 Invented: The Irish 3 Card Trick Using 4 Cards (c. 1972), FRED, The Diary Effect, The Amazing Psychic Card Effect, Open Prison Card Effect, The Amazing 10 Card Prediction, The Invisible Switch, Split Decision (Case by Jerry O'Connell). Wrote: Close Up Comedy Card Effects, Super Power Memory System, Superfast Card Magic For Beginners, Jazz With Cards, New Style Card Magic, The Complete Comedy Technique Course, The Psychic Course, How to be a Top Class Close Up Magician. Professional magician, dealer, magic manufacturer from Lancaster, PA. Invented and manufactured Phantom Ribbon, Box of Baghdad, Dagger Livestock Production, Reidel Card Rise Box, Mandarin Production Box, Chinese Rice Box, Animal Fair, Box Of Bagdad, Chinese Surprise Production Tube, Golden Disk Of Amun Re, Improved Sucker Blocks And Tube, Orchids To You, Pagoda Trick, Phantom Plastic, Push Down Dove Vanish, Rabbit Garage, Rameses Ribbon, Reidel's Improved Square Circle, Rice Box To Lantern, Sammy The Seal, Temple Of Wang, Twirl Around Box, Unicorn Box, Mean Bean Machine, and many more. 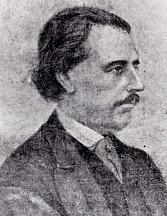 Born Jean-Eugene Robert in Blois, France. Soon after his marriage to Cecile Houdin in 1830, he adopted 'Robert-Houdin' as his stage name and had it legalized on 10th September 1856. Apprenticed as a watchmaker in Blois, he learned magic c1827 from an accidental purchase of the 2-volume 1792 edition of the Dictionnarie Encyclopedie des Amusements des Sciences, Mathematiques et Physiques, which included tricks copied from Ozanam, Guyot, Decremps, Pinetti, etc. A prolific inventor, including The Orange Tree (1845), Light and Heavy Chest (1845), Shower of Plumes (1845), Le carton fantastique (1848), Aerial (Broom) Suspension (1849), Diavolo Antonio (1849), and possibly both silent code (1849) and Stop Trick. New Zealand born Paul Romhany began a career as a musician, earning a dregee in music from Auckland University. When he developed an interest in magic, it was as a form of theatre, not just for fooling the senses. He developed a theatrical impersonation of Charlie Chaplin and used magic to develop comedy situations for the character. 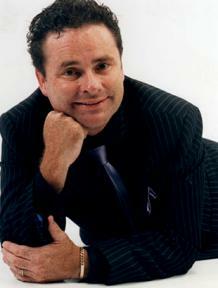 http://youtu.be/ak1jlJjPRFo He has traveled the world entertaining on cruise ships, as well as performing in theatres and on television. His magic inventions include: Dream Prediction (2000), Linking Hearts(1997), Minuette Aces (2002), Toasted (2002), Brief Case Illusion (1999), Comedy Five Card Repeat (2003) and Bunny Rabbit Repeat (2004), Comedy Drink Trick (with Ricki Dunn 2004), Time Warp (2004), Animal Bands (2005), Mixed Emotions (2006), Happy Face (1 and 2 - 2007), Travel Book Test (2007),The Amazing $20 Bill Trick (2008), Signed Bill to Can (2011), Winning Numbers (2011), Dream Prediction Close-up (2012), Production Truck Illusion (with Wayne Rogers 1991) , Extreme Snowstorm (with Marcus Jalring 2010), ...and more. DVDs: Romhany on Stage (2009), Romhany's Multiplying Bottle Routine (2006), Romhany On Stage (2009), Lunch Date DVD (2009 ), Minuette Aces DVD (2002), CSI by Hal Spear and Paul Romhany (2008). Born in Hamburg, Germany. Moved to USA. Pro dealer in Chicago (A. Roterberg, at 145 Illinois Street) by 1894 to 1916, selling his mail order business in 1908 to Ralph W. Read and his shop to Arthur & Carl Felsman in 1916. Invented Multiplying Thimbles (The eight thimbles on two hands version) and Multiplying Billiard Balls (Excelsior Ball Trick 1898). 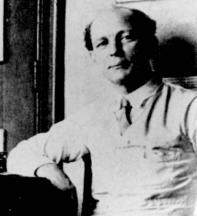 Media: August Roterberg (CD - contains copies of all his written works above). Marvyn Roy and Carol with their act, Mr. Electric, appeared at Radio City Music Hall, the London Palladium, The Latin Quarter ice shows, floor shows, night clubs, theatres, arenas and amusement parks. With their acclaimed light bulb act, and later as the Diamond Illusionist, they traveled for years with the Liberace show. Born Marvin A. Levy, he first learned magic in the 1930's from a Mysto Magic set. 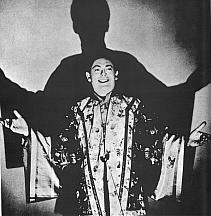 In 1939, as "Marvin, The Magic Silk Merchant" he won an award at the PCAM convention in San Francisco. In 1956, he married Carol Williams, a rope spinning ice skater, and together they developed the new electric act: "Artisty in Light with Marvyn Roy & Carol." 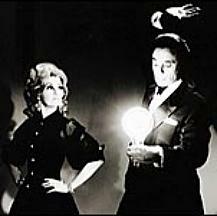 Inspired by Horace Goldin's Canary in the Light Bulb, Marvyn designed a new illusion Girl in Light Bulb. Magic Dealer/ manufacturer from South Bend Indiana. He also worked with Abbotts and Tannens, selling them some of the rights to his original effects. Invented: Spooky Spots (c. 1940), Swallowing Wand, Fantastic, Swindle Pips, Hypnotic Block, Phantom Block, Vanishing Television Set, Miracle Memory Power, Sword Through Neck, Double Dynamite, Pentro Penny, Daffy Dice (1956), Real Smoke, Mental Pencil, Crazy Cube,Coin Capers (1958), Hypnotic Card Box, Black Magic, Genie Beads (1957) , Atomic Power, Little Fooler (1958), Card and Silk Sword, Shooting Through the Girl, Double Box Prediction Chest, Cardo Escapo, Funny Money, Riddle Ribbon, Wacky Washer, Peppermint Candy Tube and many more. In the photo at the left, Roydon is shown performing his Double Dynamite ESP Card Prediction. Contributed by Dave Eaton, May 2017: "Harry Roydon was also the inventor of the "Physics Table" now in the archives of Ken Klosterman. Mr. Klosterman purchased the table and its reproduction rights from Mr. Roydon prior to Harry's death in or around 1980. Klosterman agreed to and honored Roydon's condition the table not be reproduced until after his demise. The gaffed table is similar to Robert Nelson's Medium's Miracle Table, as advertised in Nelson's Catalog #18, but works on a different principle to accomplish the same end. It has been suggested Roydon did not make much money from creating magic tricks, but did use his table for financial gain from fees paid for personal readings." 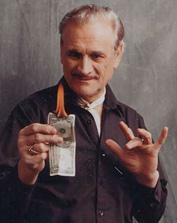 George Sands began working in magic at the age of 17 and soon was working as a demonstrator for Tannen's Magic Store in New York City. During World War II, he began entertaining his fellow soldiers with magic, and that was where his "Sandsational Rope" routine was created. Invented and Published: SandSational Rope Trick (1949), RopeSational (1961), Sandslide Book Tests, Chicken Thief Switch, Ten Cards to Pocket, Voo Doo Cards, A Poker Nightmare, Sandsational Telepathic Powers, Extra Sansational Perception, Backwards Magic Act, and many more. His son, Alan Sands, continues to sell his father's books and videos, as well as his own on THIS WEB SITE. 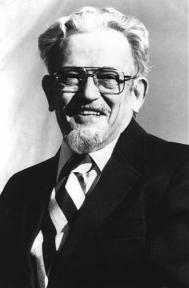 Born Alvin Duane Schneider in Detroit, Michigan. Invented: Matrix (1960), Hugs and Kisses (currently Dots and Dashes), Off (1975), Flick Cross Cards, False Start, Spell Switch, Stargate, Halo, Cone-n-Coin, Osmosis (c.2003), and many more. Wrote: Matrix (1970), Off (1975), Al Schneider on Coins (1975), Al Schneider on Close-Up (1980), Al Schneider on Zombie (1981), Al Schneider Magic (2011). Media: Al Schneider Technique (4 DVD series-2004)). His Matrix is included in: World's Greatest Magic - Matrix/Coin Assemblies DVD published by L&L Publishing. Scot was a Justice of the Peace in Kent, England. In 1584, he wrote one of the first explanitory magic books "Discoverie of Witchcraft." Scot´s work was intended as an argument against the existence of witches, and a protest to the rising tide of persecution that was occuring in England in the 1500's. Scot was guided in writing the sections of the book dealing with legerdemain by John Cautares, a 16th century French sleight-of-hand artist who made his living as a laborer and resided in London. The sections devoted to magic tricks contain valid explanations of many effects still performed today, but include very little instruction on the handling of the sleights. Among the many techniques and gimmicks "discovered" are: magicians´ wax, double-sided coins, various finger palms, classic palming, coin shells, the classic force, lapping, loading for cups and balls, threads, false shuffling, second dealing, confederacy, "bar bets" (as they would be called today), mentalism including a simple second sight-style code, false bottomed boxes, paddle tricks, the double-tape (grandmother´s necklace) principle, a four hundred year old sophisticated version of the "magic coloring book" invented by a man named Clovis, and much more. 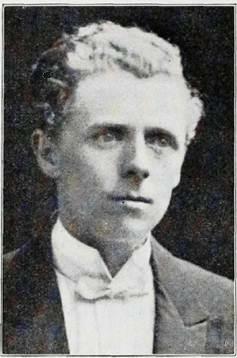 Born in Hampstead, London and named Percy Thomas Tibbles he learned magic c1895. 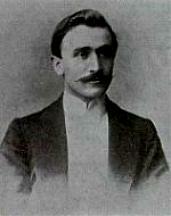 He became a professional illusionist c1900. Aka 'Joad-Heteb' and 'Joad Heteb, the Wizard of the Sphinx' he performed a pseudo-Egyptian act 1902-08. It was as Joad Heteb that he first introduced his Traveling Blocks or Egyptian Bricks, the precursor of Cube a Libre. By spelling his last name backwards and dropping one of the "b's" he transformed himself into P.T. Selbit when he "hit the big time." Tom Sellers lived in Edinburgh, Scotland during the first half of the last century. From 1927 until 1938 he wrote twelve booklets which were published by George Johnson in London. Two further booklets, Magical Mixture and More Magical Mixture were published by Davenports. He was creator of Bank Night, originally called It's Only Chance in Novel Necromancy (1935). In 1955, Ken Allen took one of his inventions and marketed it under the name "Monkey Bar." Wrote: Tricks that Work (1927), Sellers' Secrets (1931), Magical Plaisantries (1933), More Secrets (1933), Card Tricks that Work (1934), Novel Necromancy (1935), 21 New Card Tricks (1936), Immediate Magic (1937), Magic Hits (1937), Subtle Sorcery (1938), Scot's Magic (1939), Condensed Conjuring (1941), That Was Good! (1942), Tricks Tracks (1942), Twenty Tricks (1943), Magical Mixture (1943), Top Twenty (1958), (posthumously) Best Sellers (1980). He contributed to most of the magical magazines for many years, including The Sphinx, The Gen, The Magician Monthly, The Magic Wand, The Wizard and The Linking Ring. In February, 1936, he won the "Sphinx Medal" for the "Best Trick of the Year" in the Amateur Section. 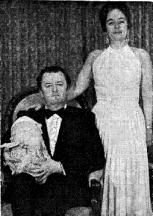 Born Alan Arthur Howson in Harrow, England, Alan Shaxon was a professional magician and a former president of The Magic Circle. He specialised in cabaret performances and was billed as one of England's foremost magicians. The Magic Circle gave Shaxon its highest award, "The Maskelyne", for services to British Magic. His television appearances have been seen by millions. He cruised the world in cabaret on the finest luxury liners, and entertained on four occasions at Buckingham Palace. Shaxon taught Tom Cruise the sleight of hand for "Mission Impossible", and appeared in Rowan Atkinson's "Mr. Bean". Invented: Confabulation, Shaxon Flap Envelope, Shaxon TR Newspaper plus drink, Final Epic. Wrote: My Kind of Magic (1970) and Practical Sorcery (1976). After he died a draft manuscript for a third book was discovered and completed by Scott Penrose and Steve Short. It had no working title but when it was published in 2014 it was entitled The Sophisticated Sorcerer. While Confabulation can mean simply to chat or confer, it is also a medical term to describe: "An attempt to fill in memory gaps by fabricating information or details." Tomoyuki Shimomura is one of a new wave of magic creators on the Tenyo Magic Company team. His forte is producing effects that are entertaining but which also have an interesting story line. 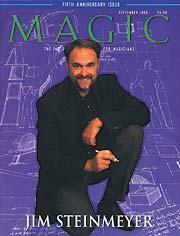 With his knowledge of close-up magic, he was commissioned to write for An Introduction To Card Magic. He is a polished technical writer and therefore invaluable to Tenyo for the instruction sheets included with the products. 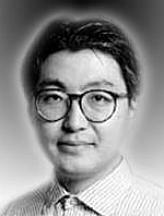 Shimomura's inventions manufactured by Tenyo: Hyper Vision (1989), Moon Spinner (1990), Wild Wallet (1991), The Nostradanus Clock (1991), The Haunting (1992), Crystal Pyramid (1994), Eye of the Idol (1995), Phantoma (1996), The Unusal Suspects (1996), Bird Watcher (1997), Pop-Up Card (1998), Lucky Rabbit (1999), Grand Derby Prediction (1999), Wild Wallet - Leather (1999), Dynamite Tube (2000), Mystery China Box (2001). 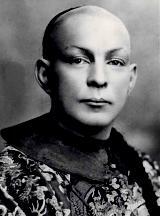 A close-up magician who grew up in Rochester, New York and studied under Eddie Fechter from Buffalo. He later moved to Hollywood and spent eight years at the Magic Castle studying with Dai Vernon. 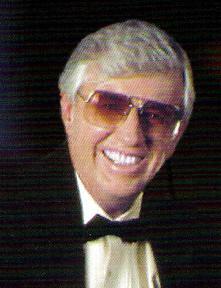 For over 20 years, he was the magician in residence at the Golden Nugget in Las Vegas, Nevada. Invented: Skinner's Ultimate Monte, Ungimmicked Ball and Vase moves, more. American magician from Washington State, Slyter was well known as a vaudeville performer, performing a "drunk act" called "A Magician's Night Out" and which featured appearing and disappearing shot glasses of liquor, steins of beer, balloons, bubbles, etc. 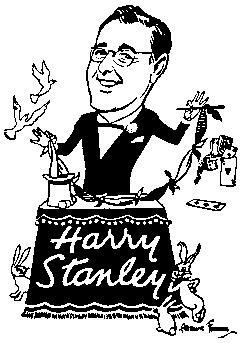 He first came into magical note at a PCAM convention in Seattle in 1933 and performed at the SAM convention in 1940. He was the inventor of a version of Multiplying Candles in which the candles are connected together by hinges hidden by finger tips. It is thought to have been the inspiration for Earl Morgan's multiplying candles. He died after a long illness at a Rest Home in Petaluma, CA, on Nov. 20th, 1980, and was buried in Tacoma, WA. 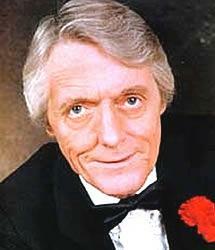 Born William Ellsworth Campbell, he changed his last name to Robinson when he started his magic career. A challenge by the famous Chinese Illusionist Ching Ling Foo, to duplicate his bowl of water production for a prize of $1000, was responsible for Robinson (who met the challenge but was never paid) changing to Chung Ling Soo and performing a Chinese-style act. In 1905, there was a bitter rivalry (or was it all made up for the publicity?) between Soo and Foo. 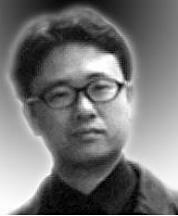 Soo's most famous trick was the Bullet Catch. The trick went wrong when Soo was performing in the Wood Green Empire, London, on March 23, 1918. Some of the gunpowder exploded in the live chamber, setting off the loaded bullet which hit Soo in the chest. 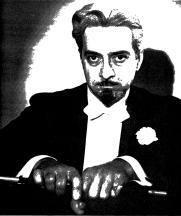 Formerly magic assistant to Jim Gerrish, branched out on his own as a stage magician in 1964, then fell under the influence of Wizard-style magic in 1975. Legally changed name to Phineas Spellbinder in 2001. Co-founded (with Jim Gerrish) The Magic Nook for Wizards, Witches and Magicians in 2003 primarily to publish The Wizards' Journal. Spellbinder is an inventor of many Wizard-style magical effects. Some of his favorites include Dominoes Vos Biscuits (1968), The Fabled Cloak of Invisibility (2006), The Crystal Clear Cups and Chicks, Crazy Cabana Illusion, Invisible Candy/Cookie Jar (released 2006), Gray-Art Principle (2003), Shrink-A-Dink (2006), Jumbo Monte (2005), Better Book Test (2006), Chinese Fish Sticks & Appearing Goldfish (2006), Poltergeist (2006), Potpouri (2006), PomPom Critters (2007), Parallel Universe (2007), Elevator Box (2003), Sefalajia Revisited (2007), The 2007 Vanishing Radio (2007), Elemental Science (2007), Silks to Christmas Tree Mystery (after Devlin) 2007, Signed Card to Sealed Deck (1999), Realistic Spring Flowers (2008), Balloon Levitation (2008), Pegasus Redeemed (2008), Elemental Science (2008), Merry Christmas Carousel (2008), Anti-Mirror Glass (2008), Seven-sided Herbal Tea Chest (2008), Cookie Force Jar (1961), Shelless Egg Cup (2008), Tangerine Box (2008), Talking Greeting Card (2008), Spellbinder-s Dye-Version Version (2008), Key-less Linking Bangles (2008), Ultimate Jumbo Monte Stand (2008), Jumbo Stage Dutch Looper (2008), Astro-Logical (2008), 12 Days of Christmas (2008), Vampire Levitation (1975), Force Field Tray Force(2009), The Big Cheese (2009), Gray-Art Switch Box (2009), Sure-Shot Card Through Glass Tray (2010), Christmas Lights From Tree (2010), Spider Ouija (2010), Vanishing Hand-Puppet House (2010), Free Will 21st Century Silks (2010), Think-A-Card (2010), Color Spot What's Next (2010), Banker's Dream (1986), Visible See-Through Nest of Boxes (2011), ABC Block Production Boxes (2011), Wizard's Wallet (with Steve Duscheck 2011), ABC Stung Revisited (2011), The Most Amazing Card Trick (2011), Ghost Card (2011), Fellowship of the Ring (2011), Santa's Magic Jingle Bell (2011), Santa's Chimney - Vertical Die Box (2011), Tilt-Back Switch Box (2011), Lunch in the Park (2011), Shadow Carton (2012), Predict-velope (1977 - published 2012), Color-Free Table Well (1980-2012), Astro-Sphere Boxes (1980-2012), Spellbinder's Rope Clip (2012), Hanky Pank Vanish (2012), Bingo Ball Cage Force (2012), Die-Confundus (1968 and improved in 2012), Three Card Trick Variation (2013), Invisible Tarot (2013), Mentalist's Dream (2014), Match Me If You Can (1964), In Your Face Slate of Mind (2015), Whap! (2015), 4-C Box (2015), Christmas Seance (2015), In Hands Elusive Elephant (2015), EZ-PZ Candle Production (2015), Snake Shadow Illusion (2015), Night Before Christmas (2015), Gift Bag Switch (2016), Alice's Wonderland Monte (2017), Hot Pips Paddles (2017), Comedy Cardometer (1964), Dominoes Vos Biscuits Revised (2018), DominoTrix (2018), Spellbinder Diary (2018), Zodiac Discovery (2019), QuarterMaster Card Trick (2019) and many more. Wrote: Tear-Able Magic (with Eleazar Goodenough - 2005), Dollar Store Magic (2007). Contributed many articles to the Oracle Quarterly between 1964-1999. Co-authored: Go Fish Card Tricks, with Qua-Fiki (2010). Edited: The Wizards' Journals, The Wit and Wisdom of Mark Lewis, Magicbob's "I Hate Card Tricks" , Magicbob's "I STILL Hate Card Tricks"
Tony, who is currently living in Swan Lake, NY, was a former demonstrator in Tannen's Magic store in New York City. When the Tannens retired, Tony bought the business in 1988 and ran it until he retired in 2003. Invented: Cutting a Woman in Thirds (1960), Room For Doubt (1972), Astro-Sphere (1974) , Silkspension, and others. Born Johannes Edmund Spreer in Germany, Edmund became interested in magic at thge age of 14. In 1926, he toured Latin America with The Great Raymond as a show mechanic. In 1928, he began his lifelong association with David Bamberg (Fu Manchu) working as chief mechanic and first assistant. He created many of the illusions, not only for the Fu Manchu show, but for other famous magicians of his era. In collaboration with David Bamberg, invented the Isis Illusion (variation of Chung Ling Soo's Mahatma Illusion), The Chinese Strangulation Rack, Variation on the Book of Life Illusion, The "Little Stinkhouse", Fu Manchu Cremation, Modified Triangle Illusion, Fu Manchu Spirit Cabinet, Canvas Covered Trunk Substitution, The Monkey Cage (Gorilla Vanish), The Robot, The Pit and the Pendulum, The Fan Illusion, The Chinese Bazaar, The Geisha Illusion, Fu Manchu Duck Vanish, The Lantern Illusion (Atomic Woman). British magician and magic dealer (Unique Magic Studio - 1946). He also co-published The Gen with Lewis Ganson from 1945 until 1970. Inventions include, Harvey And the Soldier, Man In The Moon, Stop Light and many more. Born in Husbands Bosworth, Leicestershire, England. At the age of 12, on seeing a magician at school do the Die-thru-Hat, Stanyon puzzled it out and duplicated it. Learned c1883 reading Hoffmann's Modern Magic. Introduced Paper Folding as a stage act by 1895. Magic was a monthly magazine produced and edited by Ellis Stanyon. It was first published in October 1900 and ran for 177 issues with a break during the 1914 -18 war and the final issue was published in June 1920. Wrote: Magic (1901), Bibliography of Conjuring and Kindred Arts (1899), Conjuring for Amateurs and Professionals (1897), Conjuring with Cards (1898), Hand Shadows (1898), Flashes of Fun (1897), Paper-Folding (1895), New Coin Tricks (1899), Fire And Chemical Magic ( 3 series, from 1906- 1909), Great Handcuff Tricks, Great Paper & String Tricks (1904), New Billiard Ball Sleights (1904), New Handkerchief Tricks (1900), New Card Tricks (in Four Series, from 1900 - 1910) and many more. 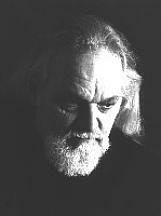 Jim Steinmeyer was born in 1958 and grew up in Oak Park, Illinois, just outside of Chicago. His brother, Harry, was interested in magic and when his brother lost interest, Jim took up where his brother left off. 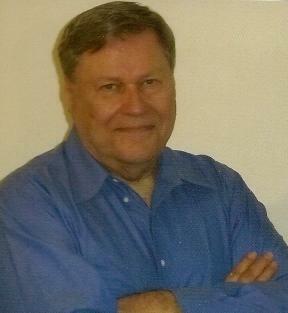 Jim was graduated in 1980 from Loyola University of Chicago, with a major in communications. It was while he was attending Loyola that he contacted Doug Henning and began designing illusions for him. Jim currently lives in California. Inventions include: Statue of Liberty Vanish, Origami, Interlude, Elevator, Walking Through a Mirror, Modern Art (1995), Bunko, One Card Monte, Matrix Poker (with Alan Wakeling), The World's Thinnest Deck of Cards, Soft Shoe Monte, Artists Daydream (1991), Artists Dream (Modern Version- 1991), Audience Acupuncture, Audience Dis-Member, Backstage with a Cane Cabinet, Bits and Pieces, Blueprint Vanish, Buried Alive Modern Version, Chainsaw Decapitation, Cube-ism, Cutout to Life, Death Tank Escape, Disappearing Bus, Do-it-yourself Suspension, Doll and Dolls House, Elephant and his Shadow, Fade-In, Fade-Out Cabinet, Goon Box Production, Headache Illusion, Headless, Holography, Hospitality (1995), Hot Air (1991), Houdinis Rope (1991), Incubus, Indiarubber (1991), Inside-Out Production Box, Lady in the Puzzle (1991), Little Dolls House, Magical Puppet Theatre, Miracle Levitation, Neon (1991), One-Way Hole, Optical Modern Cabinet, Optical Sawing, Osmosis, Perforation, Plate Glass Mystery, Pole Levitation, Portrait to Life, Real Image Ghosts, Sawing a Horse in Half, Secret Cabaret Sawing, Shadow Theatre (1995), Sliding Spikes, Small Packages (1991), Three-Space Mystery, Through a One-Inch Hole (1991), Time and Space, The Torch Box, Translucent Shadows, Two Places at the Same Time, Vanishing a Herd of Elephants, Walking through a Fan, Windshear. There are many other inventions not included in this list. Wrote: The Complete Jarrett (1981), Hiding the Elephant (2003), Impuzzabilities and Further Impuzzabilities, The Magic of Alan Wakling (1993), Art & Atrifice (1998), Device and Illusion (1991), Strange Power (1992), Modern Art (1995) The Howard Thurston Workbooks - Volumes 1 and 2, The Science Behind the Ghost (1999), The Conjuring Anthology, The Glorious Deception: The Double Life of William Robinson (2005), Charles Fort: The Man Who Invented the Supernatural (coming in 2008), and many others. Jim is also a frequent contributor to MAGIC magazine. 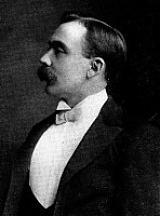 Born Harold E. Fackler, he performed as a magician on the Redpath Chautauqua Circuit with his wife, Gloria under the name of The Sterlings. He opened the Sterling Magic Company in Detroit, Michigan. Invented: Bang Gun, The Silk Winder, Pop Silks, The Sterling Egg Bag, Miko ( 3 and one half of spades) (1943) named in honor of magician Milt Kort. Sterling's weekly paper "The Magical World" (c 1910- 1911) often carried bits by his friend Servais LeRoy, among others. Maxwell Phillip Stern was born in Trenton, NJ and became interested in magic about the age of 5, but was performinjg shows by the age of 12. When he started demonstrating magic as a young man, he was known to his friends as "Duke." He became a manager of Abbott's Magic Company in Indianapolis (1946), and was responsible for organizing the Abbott Get-Togethers, often teaming up to perform with the Abbott Manager from Detroit, Karrell Fox. He was also a talented violinist. 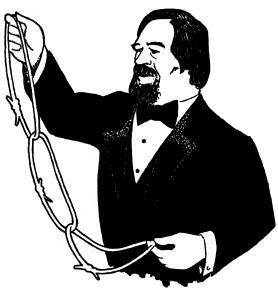 Duke was the inventor of many original effects such as The Almost Ten Count, Duke's Thimble, Duke's Copper and Silver Coin Routine, and Duke's Guatemala Rope Trick. One of his best known and most popular effects was Duke's Dye-Version, described in Mark Trimble's Volume Four Encyclopedia of Silk Magic and still on the market today. Wrote: Latest Thimble Magic (c.1945); wrote many articles for Abbott's Tops Magazine, from 1947 - 1955. Invented the Stillwell Ball (c 1887) (gimmick) used in silk and handkerchief magic. The basic principle of the thumb loop is also used for many other devices today. Born Jack Inglis in Scotland, Colonel Stodare (or Stodartt) was among the most noted performers in England until his sudden death at the age of 35. In 1865, he demonstrated the Sphinx Illusion (drawing at right) which had been recently invented by Thomas William Tobin (the first use of this principle of concealment). 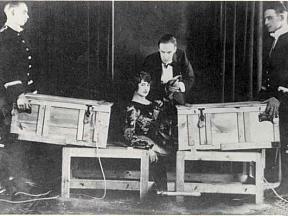 The illusion created a sensation and Stodare was invited to give a command performance to the oldest daughter of queen Victoria. 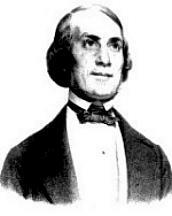 In that same year, he contracted Tuberculosis and in October of 1866, he died. After his death, his brother Alfred Inglis began performing under the name Stodare. Another illusion Stodare made popular was the Indian Basket, using the Tip-Over Trunk principle. Also invented: Vanishing Glass of Water, The Egg and Handkerchief (Silk to Egg), and many more. Wrote: Stodare's Fly Notes, or Magic Made Easy (1865). Ted Sudbrack performs professionally under the name of "Suds." Suds is a Past President and lifetime member of the Orange County Magic Club, a past president of the PCAM and a lifetime member of Ring 21, Hollywood, CA. He is also inventor of The Bumper Bag, aka "What's New?" a form of Blendo, and many sight gags for clowns and magicians. Shigeru Sugawara joined the Tenyo Magic Company in 1967, but creating magic wasn't his speciality at the time. However he did go on to create excellent tricks such as "Pencilla" and the extremely popular "Squeeze Play". 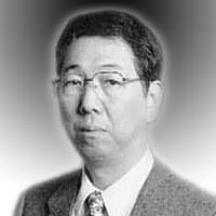 In 1977, he was awarded the Tenkai Prize. Shigeru is a consistent inventor who created over 25 Tenyo tricks. Sugawara's inventions manufactured by Tenyo: Art Bank (? ), Rope to Silk (1975), Dynamic Coins (1975), Water Mystery (1976), See Through Card (1976), Squeze Play (1977), Ultra Tube (1977), See Through Guillotine (1977), Card Frame (1977), Card Changer (1978), Pendant (1978), Mystery of the High Hat (1979), Lucifer's Lock (1980), The Frame of Destruction (1980), Black Hole (1980), Tunnel of Darkness (1980), Wonder Window (1982), The Alpha Tunnel (1984), Excalibur (1985), Paradox (1986), Ninja Experiment (1987), Mirage (1987), The Gorilla Bar (1987), Space Towers (1988), Mini-Zag (1989), Pencillia (1993), Burglar-Ball (1994), Merlin's Coffer (1995), Money Shredder (1999), Money Cutter (2000). 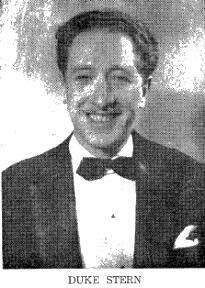 Inventor of Color Vision Sunshine, Martin L.
(1897-1978) was born in Harrisburg, PA. Martin performed as "Kismet" around the world and as the feature performer at the Northernair Showboat in Wisconsin for over 30 years. He began professionally in 1907, specializing in second sight. 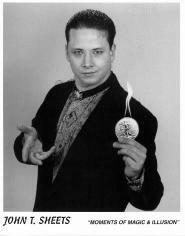 Sunshine was a friend of Harry Houdini and a charter member of the Society of American Magicians. He invented "Color Vision" c. 1930, which was then marketed by S. S. Adams and Co. and which soon became one of the most popular mental tricks of all time. Toru Suzuki created what is considered one of the most famous and popular Tenyo Magic Company tricks of all time - "Crystal Cleaver". His visual magic is very creative His most recent Tenyo creation is "Salt Cups." Suzuki's inventions manufactured by Tenyo: Micro Magic Bank (? ), Transpa Vision (1992), Crystal Cleaver (1992), Future Clock (1994), Oh No! (1994), Credit Slasher (1993), Clyde - Magic Rabbit (1995), Hankie Penetration (1996), Trisector (1996), Funnel Vision (1997), Puzzling Queen (1998), The Cutting Edge (1999), Magic Painting (1999), X-Ray File (2000), Salt Cups (2001). 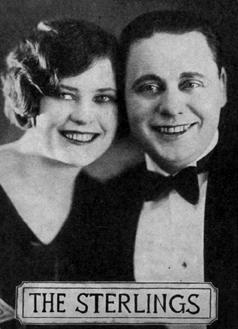 Charles Parker Swan performed with his wife, Claire, as the comedy team of "Parker Swan and Claire." Their acts included "Prunes of all Nations", "Fruits I have Worked With," and his lecture "How to Force a Watermelon." James Wesley Swoger was born in Pittsburgh, PA. He became interested in magic at the age of five and gave his first show at the age of eight. He opened his first magic store (managed by his mother) in 1937. Manager and owner of Regows Magic Studio in Pittsburgh, PA (Spell Regows backwards!). He renamed the business "James Swoger House of Enchantment" circa 1968. Invented: Blushing Nickle, Sparkle-Lite Production Tube, Mental Stamp, Mental 13, Swoger Coin Box, Spider Beside Her, 7th Wonder Card Box, Digitelephathy, Enchanted Confections, Keni Key, Mental Slate, Skeleton In The Closet, Sliding Glue, Sphinx Production Box, Stage Size Chineese Gong, Topsy Turvy Drink, Tricky Bottles and many more. Born Charles Edgar Silber, Jr. of Cincinatti, Ohio. He began his career as an actor, and had appeared in more than 70 movies by the time of his death. He moved to California in the 1950's and opened The Magic House of Charles, first on Hollywood Boulevard, and later moved it to the Mission Inn Hotel in Riverside, CA. He was performing a magic trick for a customer in his shop when he suddenly passed away at the age of 70. His main claim to fame as a magician was inventing Charles' Out of My Hat (1942) in which a rabbit hand puppet appeared in a magician's top hat and performed a variety of magic tricks. (1961 - ) Daniel Sylvester Battagline was born in Youngstown, Ohio, and grew up in the rural town of Berlin Center, Ohio. Inspired by the antics of cartoons that had thrilled him as a boy, he used his mechanical and artistic skills to design and construct some of the wildest, most cartoon-like effects ever presented in a live show. 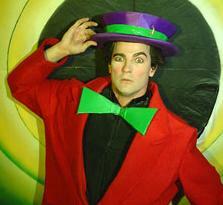 His madcap, stage persona, called, "Sylvester the Jester: A Real Live Cartoon," emerged during the 1990s and expanded his creativity into a whole new dimension. Currently, he lives in Bellflower, California and continues to perform close-up, parlor and stage magic. He also functions as a consultant for other magicians and participates regularly in Magic Castle activities. Wrote: Sylvester Pitch Lecture Notes, 1993; Hurtling the Moon, Creative Strategy Lecture Notes, 1995; Sylvester The Jester's Creativity Lecture Notes, 2008.